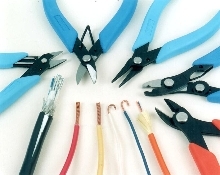 Tool Kit suits electrical and electronics applications. TK2100 field service kit is designed for electrical and electronics installation and repairs. 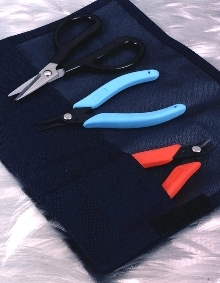 It includes Model 410T Micro-Shear(R) Flush Cutter; FSS-6 stainless-steel scissors for cutting PVC jacketing, cables, pins and dowels; and 450 Tweezer Nose(TM) pliers for forming connectors, tightening pins, and holding wire. Items are packed into tri-fold nylon fabric pouch with individual pockets. Hand Tools work on electrical wiring.